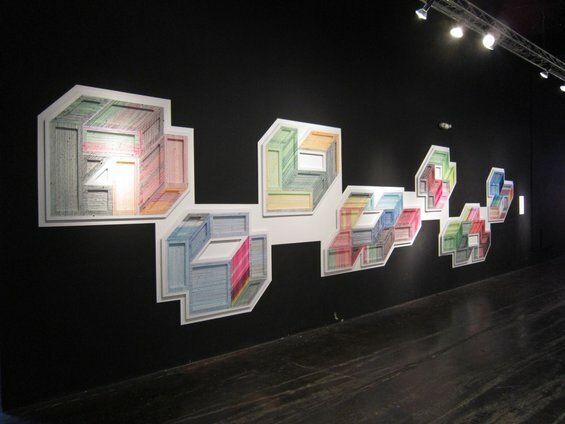 Work by Cuban artist, Rene Francisco Rodriguez, was snatched up by the Cisneros Art Foundation. His paint has been layered on the canvas with a spatula, using a meticulous pointillist technique. Most of his art has sociological and political themes. 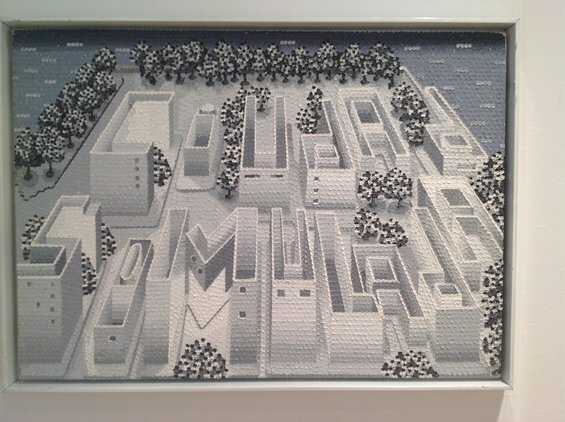 One of his pieces shows masses of indistinguishable faces in black-and-white while some show architectural buildings in the shape of text that send a historical message. Ramiro Gomez is another young Latin American who is on his way to super stardom, with works in the Museum of Contemporary Art, San Diego. His parents emigrated from Mexico and set down roots in Los Angeles. In 2009 Gomez became a live-in nanny in West Hollywood and observed the many Latino workers arriving each day to assist in household maintenance. Soon Gomez started a series of "drawings" titled Happy Hills, a documentation of the Hispanic workforce who tirelessly preserve the beautiful imagery of the affluent. Ramiro embellishes the pages of high-end home décor magazines to make his point. 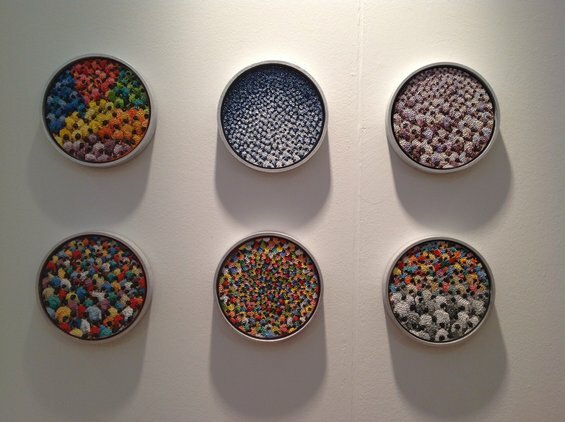 Guadalajara-based artist Jose Davila’s work was almost sold out the first day of the Basel fair. He is primarily known for his assemblages of found objects but has now branched out into Richard Prince-like photography. 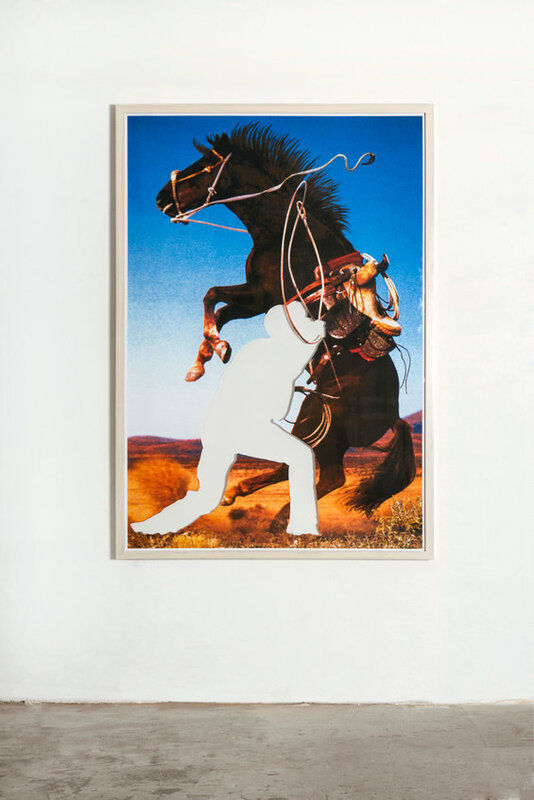 He is taking images from the cigarette-ad cowboy series and lifting out the rugged Western figure, bringing the cut-out to a whole different level. 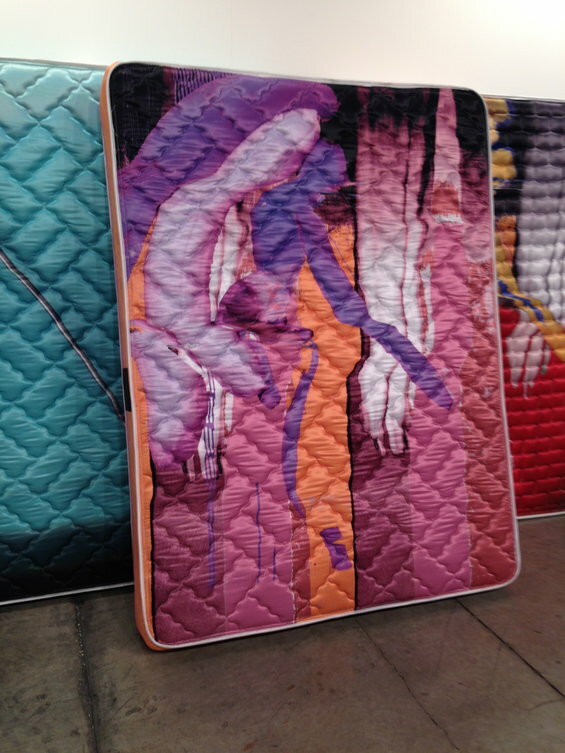 Some other great finds were the mattresses by Wade Guyton and Kelley Walker. The duo have now started incorporating functional objects like tables and beds into their artistic repertoire. Digital weaving, approving tufting designs and matching mattress tape were no small tasks...and yes, not only are these suitable for the gallery, you can sleep on them as well! 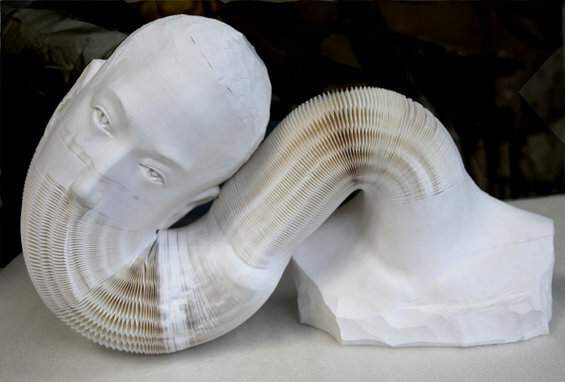 Check out Chinese artist Li Hongbo’s flexible paper sculptures. 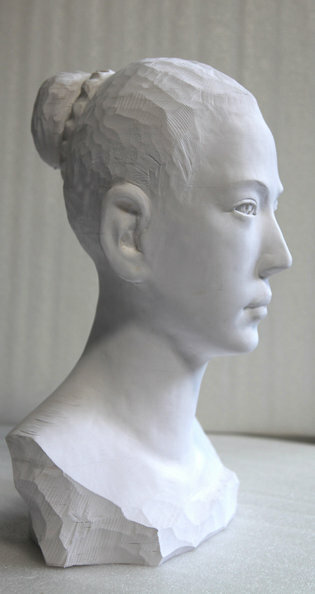 They look like solid marble busts but they are actually made of paper and bend like a slinky! A book editor and designer, Hongbo has a true obsession with paper and its endless possibilities. His crazy experiments began when he purchased a honeycomb paper ball used for festive decorations in China and took it apart to see how it was made. 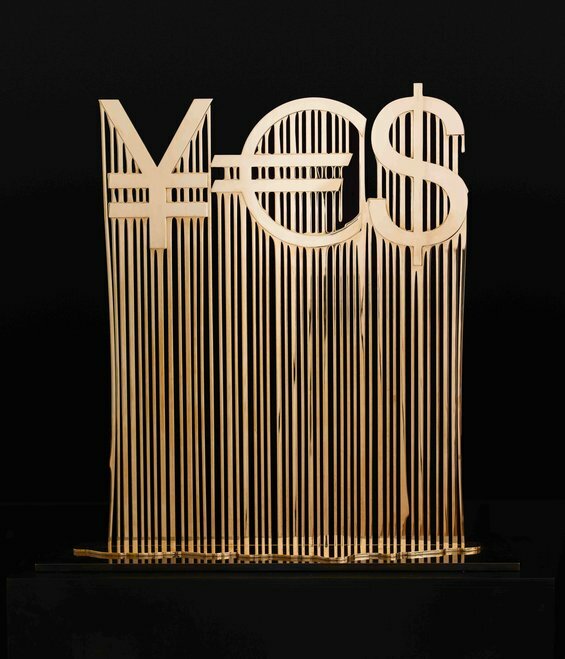 Using common paper, Hongbo sticks thousands of sheets together with carefully placed strips of glue and uses an electric saw to form these stacks into masterpieces. Argentinian Analia Saban’s sculptural paintings are the result of the artist’s interest in dissecting the painting process. Saban describes her own method of working as both artistic and scientific—an approach that was inspired by her former instructor John Baldessari. She is best known for using laser cutters, silicone molds, and erosive techniques. Her practice has included unraveling painted canvases and wrapping the threads into a single ball and using photographic emulsion as a device for applying marks to painted surfaces. 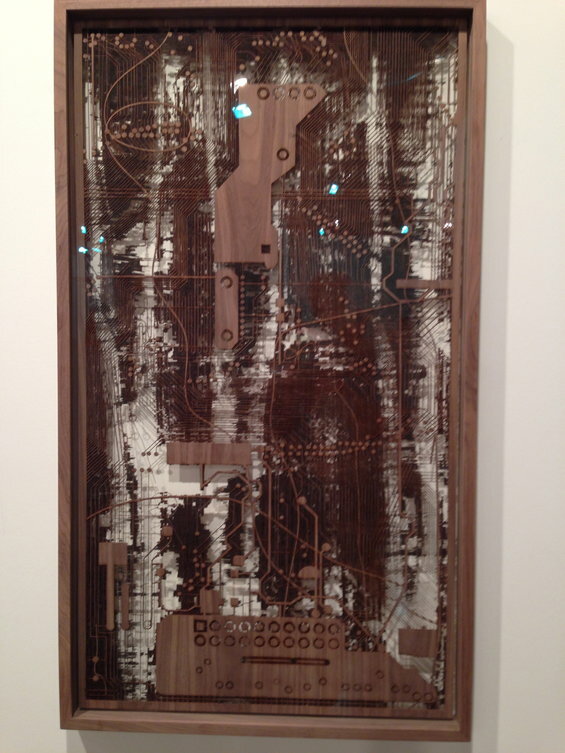 At the Basel fair, she exhibited wood circuit boards to further explore her deconstructionist values. 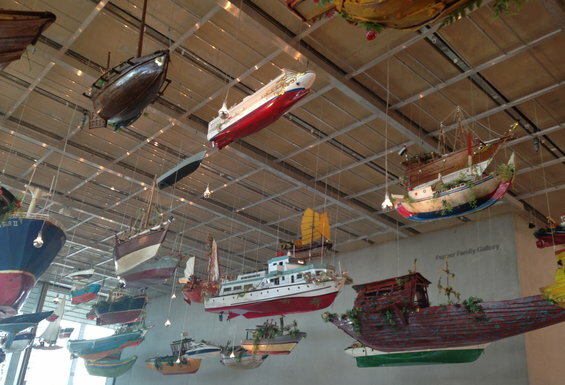 Saban has been included in a number of group shows, including at the Hessel Museum of Art at Bard College, the Los Angeles County Museum of Art, SCAD Museum of Art in Savannah, and the Hammer Museum in Los Angeles. 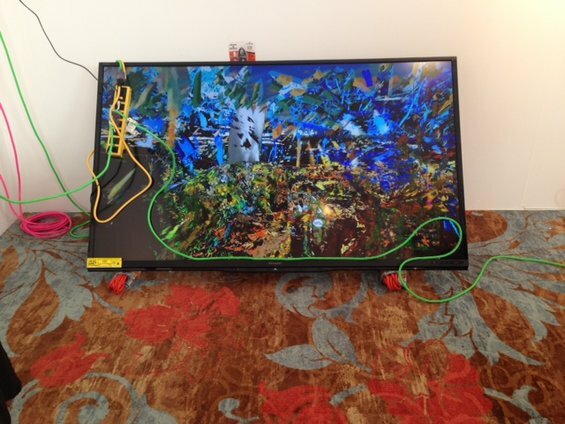 Emerging artist Borna Sammak displayed TV sculptures at the NADA art fair, fully equipped with extension cords, tags and notes. Sammak generates his video collages by overlapping multiple movie trailers and various other film clips, removing parts of the image to achieve the grainy edges and then “bumping” them against each other to explore new and innovative ways of drawing. When Aiko Hachisuka doesn’t want a piece of clothing any more, she doesn’t just bag it for the thrift shop. The LA-based artist’s bulging cloth sculptures are made from clothing she’s folded, screen-printed, stuffed and stitched together in large, elaborate forms. 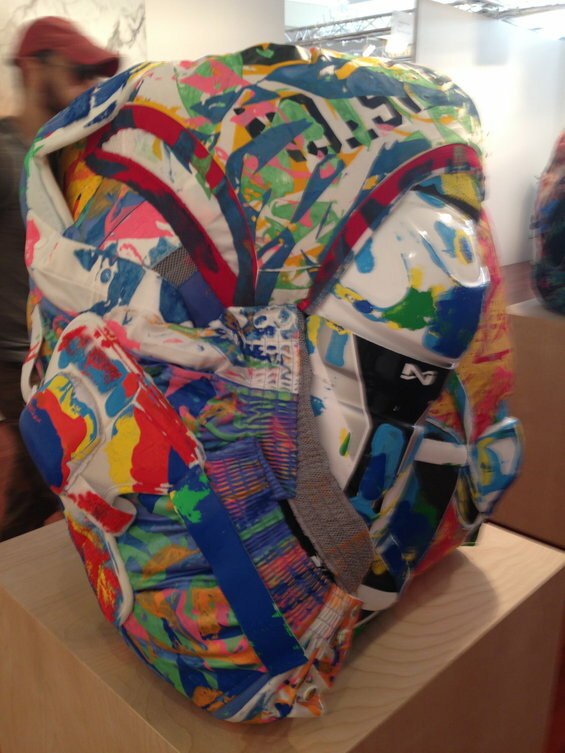 She also has created a series of works on paper from this process, with impressions of loosely folded clothing in bright colors. The photographic work of Brittany Nelson challenges the medium’s characteristic conventions. It defies our traditional expectations of how to look at photography. From afar, her compositions can easily evoke the translucent layers of watercolor, finely etched lines or even the shadows of smoke. 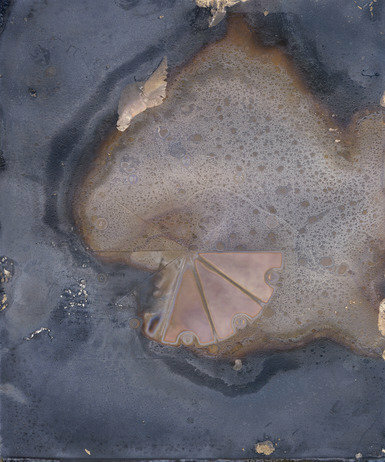 While her training at Cranbrook has equipped her with a solid background in photography, instead of using a camera and film, she extracts her compelling images from the reactive relationships of the chemicals involved with Silver photo paper, then enlarges her imagery with a scanner. 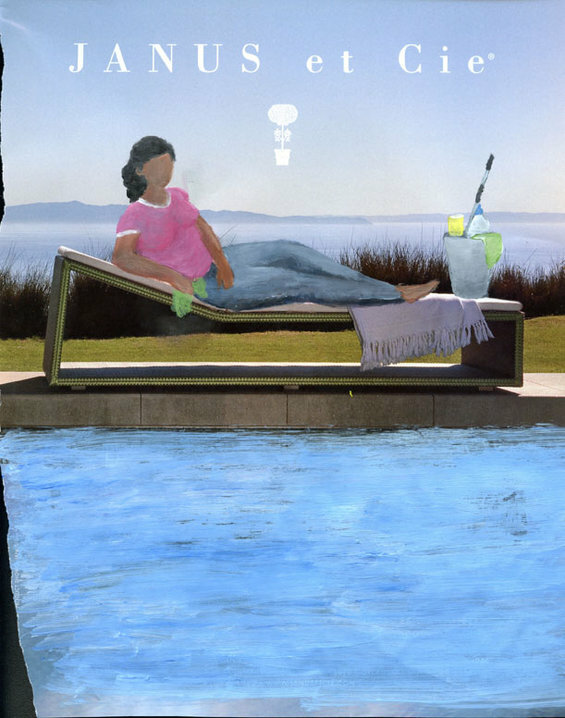 What fascinates her is the separation of the photo process from the representational image. 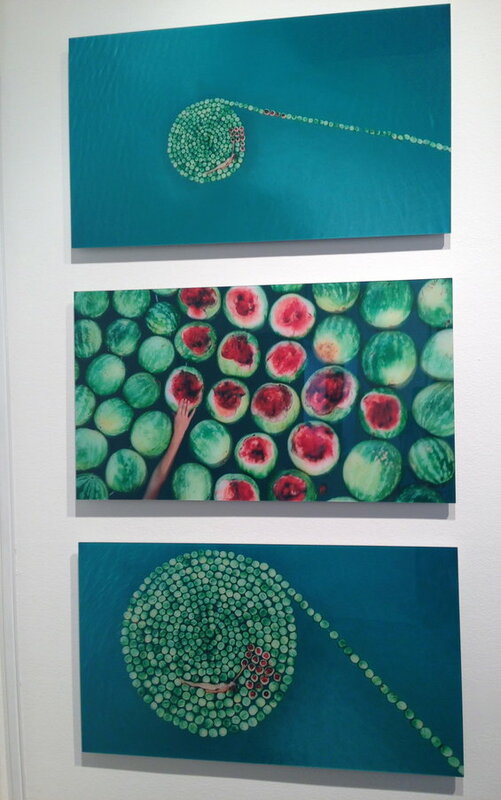 In “DeadSee”, a cord connects 500 floating watermelons, which form a coiled raft on the buoyant waters of the Dead Sea. Sigalit Landau’s video of this work is offered as a sequence of 18 different still shots. Her use of the spiral symbolizes the connection of the Dead Sea to Jewish and Israeli identity, merging East and West, past and present. It highlights the sea as a natural border between two countries, a healing site and the place on earth where the high salt content represents death and destruction. 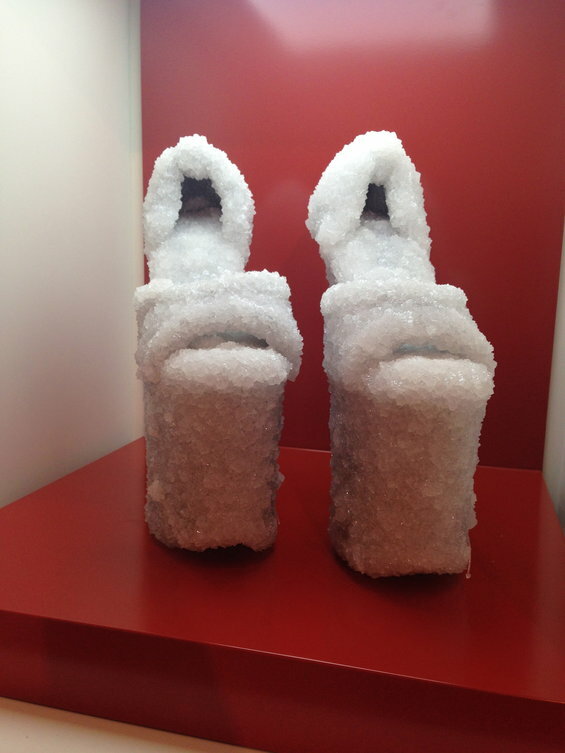 Landau also suspends various objects in its water, such as shoes and chandeliers, creating a lab of “accelerated archeology.” Like the story of Sodom, where Lot’s wife was transformed into a pillar of salt, Landau’s objects become completely coated in salt crystals after several weeks and thus altered or reborn.